Lois Collins at the Deseret News has published a very nice interview with Andrew Cherlin around the release of his new book, Labor’s Love Lost: The Rise and Fall of the Working-Class Family in America. Cherlin is a fellow member of the Council on Contemporary Families, and he is a committed truth-teller. I don’t have my whole review of his book yet, but I surely recommend it, although I disagree with him on some things. Here are three excerpts from the interview, with unsolicited responses from me. I really don’t have a fundamental beef here, and the parts I’m not quoting are the parts I agree with more. But I think these bits are important, too. DN: What happens to kids when their family life isn’t stable? Cherlin: We know that kids who experience family instability tend to have more behavior problems and act out at school and at home. That’s especially true for boys. Having unstable family life seems to be more problematic for boys than for girls and more problematic in the emotional domains than in the acquisition of knowledge. So the trends we see matter for kids because unstable family life increases the risk of behavior problems and therefore decreases the rate of graduating from high school. 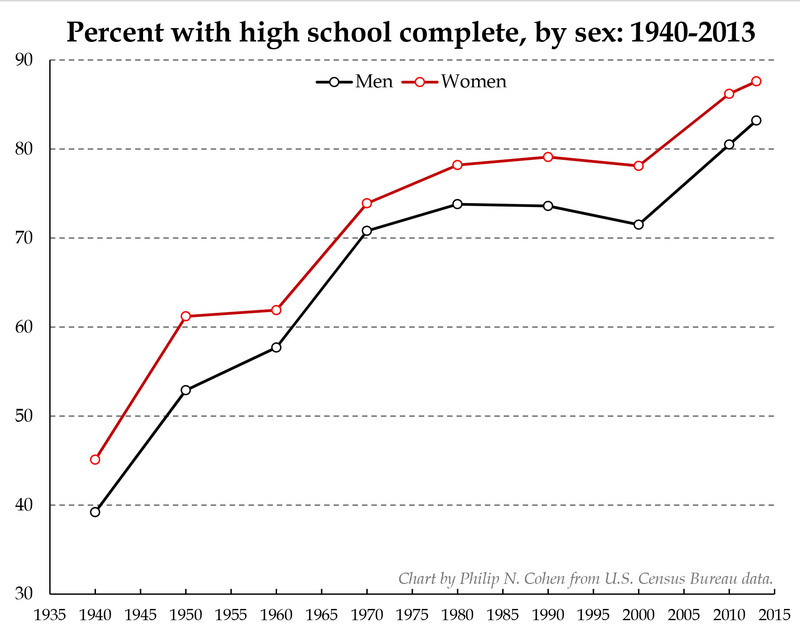 There was a period of stagnation for several decades, but since 2001 high school graduation rates are climbing again. This is at the same time that family instability has increased more or less continuously. So whatever the increased risks associated with that, at the aggregate level at least we have been able to overcome that effect. Solving problems like failure to graduate high school can come from reducing risk factors — like family instability — or by overcoming them through other efforts. The need to consider the costs and benefits of both approaches. DN: What do we do about it? We’re not going to get everybody to go to college. Cherlin: No, we’re not going to get everybody to go to college. But we could do a better job of educating people for the jobs that do exist. There still are some jobs in the middle of the labor market, such as in the health care field — I’m thinking of medical technicians or medical records specialists. I think we could do a better job of supporting education and training for people who are not going to get a four-year degree. I think education is a big part of the solution. I don’t think it’s the whole solution by any means, but it could help. I think we need to give up the dream of having a four-year college education for every American and realize that we might be better off training some people for reasonable-skill jobs that still exist in the job market. I really don’t agree with this, but it’s become a popular thing to say. What about this trend suggests we are at some kind of ceiling? DN: Are there changes to be made on the culture side [to improve family stability]? Cherlin: I’m not sure we can do things culturally. I think we need to try. I would acknowledge that others feel that, too. What might one do? We could try getting out a cultural message that says to young adults, ‘Don’t have children until you’re sure you’re in a lasting relationship.’ We’d have to make a cultural change in the acceptability of having children outside of marriage. That change has not been entirely positive. Could we have a social messaging campaign that tries to get young adults to postpone childbearing until they’re in a relationship, rather than going ahead and having kids outside of a stable relationship? Whether we can do that successfully, I don’t know, but I really think we ought to try. This refers indirectly to the recent book by Isabel Sawhill, Generation Unbound, in which she argues for a cultural campaign to discourage childbearing outside of stable, long-term relationships. Of course, we have had non-stop cultural campaigns — formal and informal — pouring shame and stigma on single mothers (and fathers) for at least 30 years. I’m glad Cherlin and Sawhill are in favor of expanding the message beyond marriage to include stable relationships, but I think it amounts to much the same thing. I have several points of disagreement. The first is over the idea that single people shouldn’t have children. Yes, on average children of single parents have more of some kinds of problems than children of married parents, especially problems related to shortages of money and time. But we also know that many children of single parents do fine — it’s not moon-shot difficult, it’s tough-challenge difficult. Given that, do you really want to tell a 20-year old woman who has no prospect of finishing college and no “stable relationship” that she should just postpone having children? Till when? Most people think having children is one of the most important things they will ever do, it’s a goal in life, it literally gives life meaning (I recommend Children of Men). For those of us with money, power, and privilege to tell poorer people that they should just shelve this fundamental source of purpose and meaning in their lives because it will be difficult and might inconvenience us just rubs me the wrong way. My second point of disagreement is less visceral and more practical. I don’t see how this is going to work. There is no evidence, especially not with promoting marriage. Sawhill and Wilcox like to point to the campaign to prevent teen pregnancy, but that’s mostly misplaced (as I wrote here): the teen birth rate is mostly down because women are postponing births at all ages — because they have better opportunities, especially for education and careers. So rather than continue to promote the idea of “doing things culturally,” which has a proven record of failure, why not promote higher education, which we know we can do successfully, and which has demonstrated effects on delaying childbearing, increasing family stability, and improving the economy? If we can promise people access to an affordable college education I would be much more willing to encourage them to delay having their children. That would be useful, practical advice — not empty moralizing. great stuff, as always, philip. i especially enjoy seeing fellow truth tellers working through their different visions of the truth. 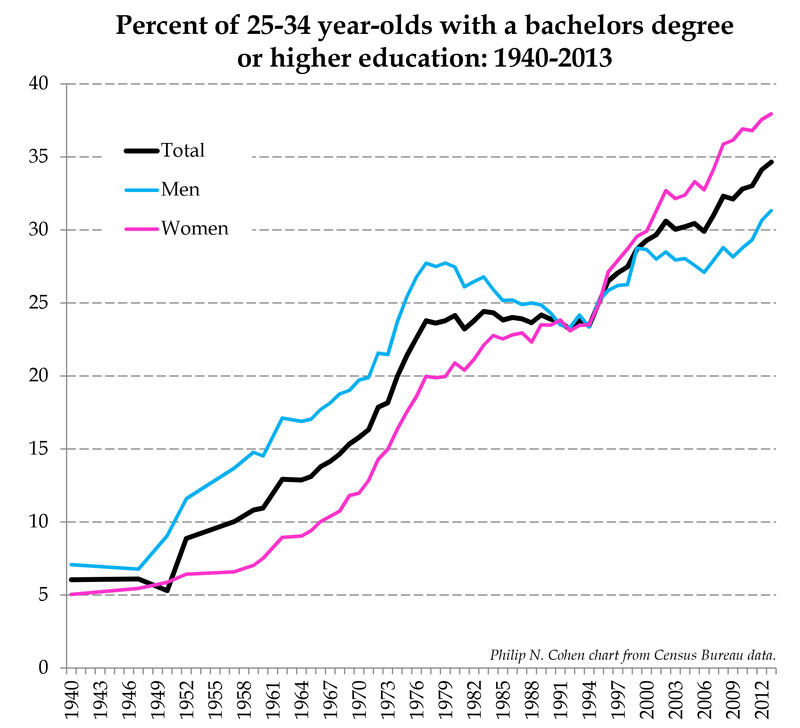 Regarding Figure 1: Note that graduation rates were 72/73% (men/ women) for 35 years, and then shoots up to 84-85% after 2000. This is essentially a result of a Clinton administration policy directive to graduate any child who came to school for four years. It was a corollary of stay in school program which was intended to keep students away from the cocaine trade that ravaged the country. This is reflected in th NCES grade 12 scores which have changed little for 20 years. Now the comparisons with OECD are more fruitful. 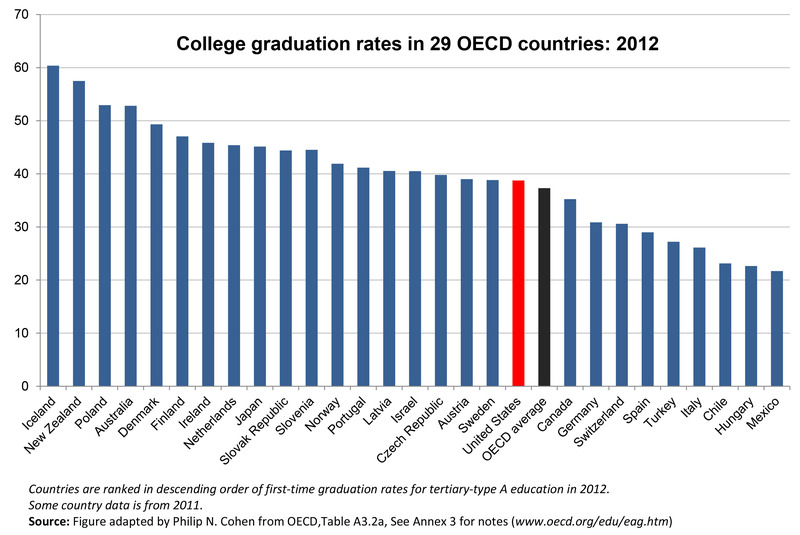 the white graduation rate of 45% is comparable to Ireland, and Netherlands. Note also that US has a large associates program form community colleges with some 800 K people graduation from community colleges. As a total, whites graduating from community college+college = 11,67,649+552,863 = 17,50,000 or 68%; given the high school graduation rate is 83%, more than 80% of the white high school grads complete college or AA. The numbers for Asians are even more mind blowing; out of 187,000 AA/HPI, more than (117,000+44,000) or 80% complete some form of college. A majority (70%) of Hispanics in US are from Mexico; their college graduation rate aligns with Mexico. An easy estimate and comparison of African american graduation rates is not available, but it can be said that it is better than any Caribbean country or African. 1. A large number of students majoring in various cultural studies, education, communications, who will have difficulty finding jobs. 2. A huge population of minorities stuck with a large debt even before they start working. Outside of college professors, the proposal to increase grads does not help any one. There is no evidence we can even increase the number of grads. I completely agree with Vijay. Encouraging or providing college when students are not capable or WILLING to participate results in high levels of wasted expense and time. College stats are in and of themselves meaningless if the students get no value out of their college degree. If they fail to get a degree that will earn enough of an income to provide support for themselves, going to college is a waste of resources. Similarly, high school graduation rates are meaningless if the graduates do not leave with a basic set of reading, math and civic skills. So citing increasing graduation rates really says nothing to the fact if 18 year olds are any better off than they were in 1940. Also – regarding “For those of us with money, power, and privilege to tell poorer people that they should just shelve this fundamental source of purpose and meaning in their lives because it will be difficult and might inconvenience us just rubs me the wrong way.” – The social pressure from individuals with money to encourage appropriate child-bearing decisions, results from the fact that the wealthy end up paying for these decisions. If a 20 year old mother decides to have a child to fulfill her fundamental life purpose of procreation, then she should be able to support and care for the child. I don’t mind willing community involvement, it DOES take a village to raise a child – but when you start blindly handing over welfare, food stamps, school breakfasts, school lunches, school dinners, healthcare, etc – Paying members of society will start to try to enforce rules, so that we do not have to pay for other individuals careless decisions. Gosh, I didn’t realize we are blindly handing over that list of benefits you name. Where do I go to line up?